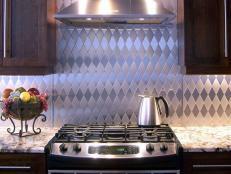 Customize your kitchen and help the environment with this beautiful backsplash made of recycled aluminum. 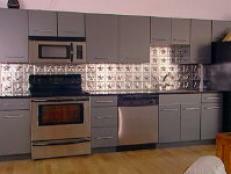 Be friendly to the environment with a recycled aluminum backsplash. 1. Measure the dimensions of your backsplash. Using a large sheet of paper or cardboard, transfer the measurements to the paper, then use scissors to cut a template. 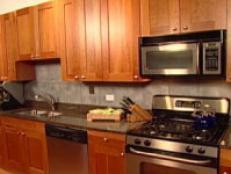 Set the template in place and tweak it until it fits the backsplash area perfectly. Be sure to mark the outlets. 2. Place the template on a flat surface and lay your tiles out to create a pattern you find appealing. 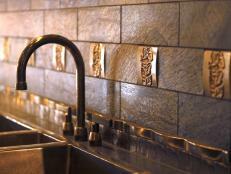 We used 4" x 4" tiles with three different finishes (vibrated, polished and matte) set in a random pattern. "Back butter" the tiles by applying adhesive on them. 3. 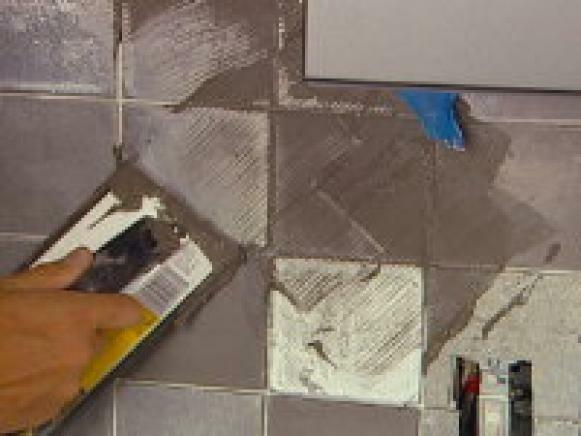 Use your 1/2-inch trowel to spread the tile adhesive on a small area of the wall. "Back butter" the tiles (put a little bit of adhesive on them) then stick them to the wall according to your preset pattern. Place spacers in the corners of each tile; this will create your grout line. Work in small increments so the adhesive doesn't dry. 4. When you get as many whole tiles in place as you can, use the tile grinder to cut the remaining tiles to fit the remaining row. Follow the manufacturer's specifications and be sure to follow all safety precautions when using the tile grinder. 5. Once the tiles are cut, stick them to the wall with adhesive. Exercise caution when installing around outlets; make sure no exposed electrical wire touches the metal tile you are installing. Even better, turn off the electricity to the area where you're working. You may have to cut the tiles to fit them around the outlets. 6. Allow 24 hours for the adhesive to dry before you grout the tiles. 7. Prepare the grout according to the manufacturer's instructions. Using your cement mixer, mix the grout in the bucket until it is the consistency of pancake batter. Grout is applied to the tiles in a diagonal pattern to fill cracks. 8. Use a rubber grout float to spread the grout over the tile. 9. Wait 15 minutes and remove excess grout with a damp sponge before it hardens completely. Allow the grout to set firmly according to the manufacturer's instructions. 10. After the grout is set, clean your new tiles thoroughly with mild dish soap and warm water. 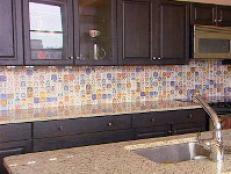 Create a custom kitchen backsplash with inexpensive glass tiles and marbles. 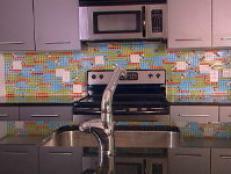 This colorful, geometric design will give your kitchen a bright, fresh look. 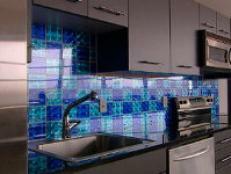 Create a checkerboard kitchen backsplash using stick-on holographic tiles. Mixing colors and designs gives your kitchen visual appeal. 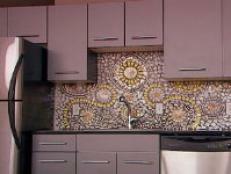 Create a beautiful mosaic kitchen made from broken china plates and cups. This unique idea lets you create any pattern you like for a truly one-of-a-kind look. 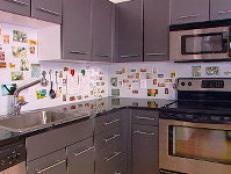 This clever idea lets you use laminate to transform your backsplash. Choose a stainless steel backsplash to round out your modern kitchen, giving it an easy-to-clean surface and a scratch-resistant finish. 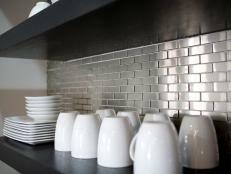 Get info and ideas for metal tile backsplashes, and prepare to install a durable and visually striking backsplash in your home. 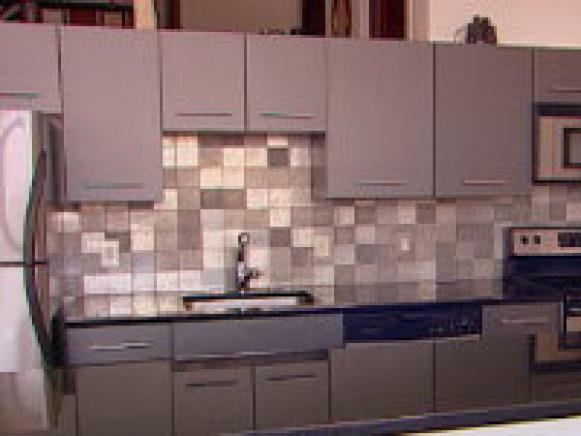 Get all the info you'll need on tin backsplashes, and prepare to install a durable and elegant backsplash in your kitchen.